Inflammation: What Is It, and how can my diet and behavior affect it? While technically a noble intention, let’s first acknowledge that this term is used loosely in everyday conversation, but it’s more misunderstood than one might initially believe. Let’s talk about this elephant in the room, dive in, and answer a few key questions: What’s inflammation in the first place? What factors (dietary and otherwise) contribute to, or mitigate it? And finally, how might we modify our diets and our behavior to reduce it? 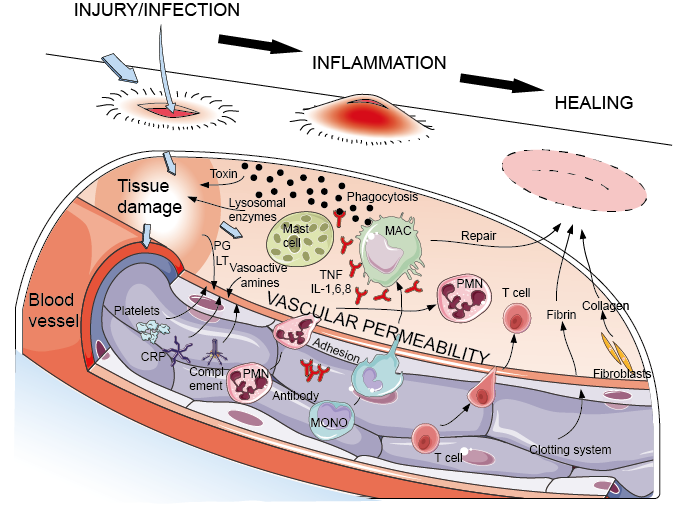 How do we measure inflammation? Although measuring low-grade chronic inflammation (read: A chronic, low-grade immune response) carries a number of limitations, studies frequently measure cellular biomarkers such as activated monocytes, cytokines, chemokines, various adhesion molecules, adiponectin, non-specific markers such as C-reactive protein, fibrinogen, and serum amyloid alpha. Key inflammatory pathways include sympathetic activity, oxidative stress, nuclear factor kappaB (NF-kB) activation, and proinflammatory cytokine production.4 Now you might wonder, ‘What does this mean for me? What modifiable factors can activate my key inflammatory pathways?’ If we are to address this question appropriately, let us turn our attention to both dietary and behavioral moderators. What makes up an anti-inflammatory diet? Compelling research from large-scale, longitudinal observational studies including the Women’s Health Initiative Observational Study6 and Multi-Ethnic Study of Atherosclerosis (MESA) study7suggest that a diet with appropriate calories that is low in refined carbohydrates, high in soluble fiber, high in mono-unsaturated fatty acids, a higher omega-3 to omega-6 ratio, and high in polyphenols, all have anti-inflammatory effects on the body. 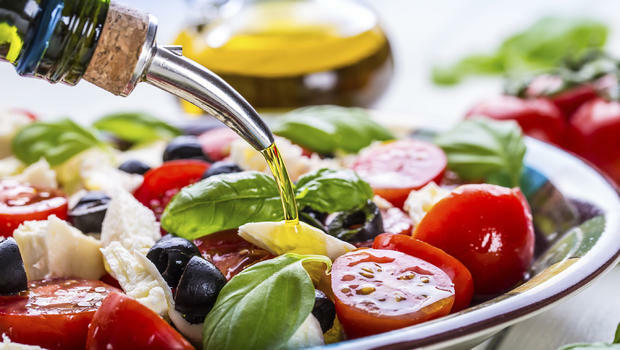 A Mediterranean diet pattern that incorporates olive oil, fish, modest lean meat consumption, and abundant fruits and vegetables, legumes, and whole grains, shows more anti-inflammatory effects when compared to a typical American dietary pattern. Other observational and interventional studies have also suggested that dietary patterns incorporating green and black tea, walnuts, ground flaxseed, and garlic are also associated with reduced inflammation. Can my stress levels influence inflammation, too? Behavioral studies have shown that prolonged psychological stress can activate the same pro-inflammatory pathways we’ve been discussing all along. While chronic psychological stress can promote over-expression of pro-inflammatory mediators, it can also promote overeating unhealthful foods in the absence of hunger. 8 Repetitively stress-eating calorie-dense, nutrient-poor foods not only further exacerbates psychological distress and creates a vicious cycle of stress-eating, but over time promotes adiposity, which we’ve described is itself a pro-inflammatory state. This ‘cross-talk’ between the brain and body suggests that strictly dietary or strictly behavioral interventions are not enough to reduce inflammation on their own. Instead, we must consider integrative diet and lifestyle preventions/interventions simultaneously. Going forward, we’ll need better biomarkers and more research looking at individual responses to diet (personalized nutrition! ), and better understanding of how food components and behavioral factors modulate genetic targets involved in the inflammatory response. What is an inflammation? National Center for Biotechnology Information. https://www.ncbi.nlm.nih.gov/pubmedhealth/PMH0072482/. Published January 7, 2015. Accessed March 16, 2018. Hunter P. Stress, Food, and Inflammation: Psychoneuroimmunology and Nutrition at the Cutting Edge. EMBO Reports. https://www.ncbi.nlm.nih.gov/pmc/articles/PMC3492709/. Published November 2012. Accessed March 16, 2018. Hunter, Philip. The Inflammatory Theory of Disease. EMBO Reports, Nature Publishing Group, Nov. 2012, ncbi.nlm.nih.gov/pmc/articles/PMC3492709/. Galland, Leo. “Diet and Inflammation.” Sage, 7 Dec. 2010, journals.sagepub.com/doi/abs/10.1177/0884533610385703?url_ver=Z39.88-2003&rfr_id=ori:rid:crossref.org&rfr_dat=cr_pub=pubmed. Sears, Barry, and Camillo Ricordi. “Anti-Inflammatory Nutrition as a Pharmacological Approach to Treat Obesity.” Journal of Obesity, Hindawi Publishing Corporation, 2011, ncbi.nlm.nih.gov/pmc/articles/PMC2952901/. Thomson, C A, et al. “Association between Dietary Energy Density and Obesity-Associated Cancer: Results from the Women’s Health Initiative.” Journal of the Academy of Nutrition and Dietetics., U.S. National Library of Medicine, ncbi.nlm.nih.gov/pubmed/28826845. “Associations of Dietary Long-Chain n-3 Polyunsaturated Fatty Acids and Fish With Biomarkers of Inflammation and Endothelial Activation (from the Multi-Ethnic Study of Atherosclerosis [MESA]).” The American Journal of Cardiology, Excerpta Medica, 4 Mar. 2009, www.sciencedirect.com/science/article/pii/S0002914909001088?via=ihub. Tryon, M., Carter, C., DeCant, R. and Laugero, K. (2013). Chronic stress exposure may affect the brain's response to high calorie food cues and predispose to obesogenic eating habits. Physiology &amp; Behavior, 120, pp.233-242. https://nutrition.org/wp-content/uploads/2018/03/mind-body-connection-1.jpg 450 600 Sarah Dimitratos https://nutrition.org/wp-content/uploads/2016/10/asn-logo-2.gif Sarah Dimitratos2018-03-16 15:00:322019-01-31 10:02:56Inflammation: What Is It, and how can my diet and behavior affect it? The relationship between nutrition and health is fully entrenched in the mainstream media – everyone from career scientists to our next door neighbor seems to be an expert on the topic. Trained health professionals and researchers do our best to deliver credible information, but it’s all too easy for clear messages to get lost in the constant stream of 30-second sound bites. Dr. Andrew Brown, a Scientist with the University of Alabama-Birmingham’s Nutrition Obesity Research Center (NORC) & Office of Energetics, is focusing his current work on illuminating common misconceptions in the field of nutrition and increasing awareness of media perspectives and biases. I recently had the opportunity to ask him a few questions related to research integrity, science communication, and being a part of the next generation of nutrition researchers and educators working to effectively deliver nutrition information in the Digital Age. Tell us about your work with NORC and the Office of Energetics. The majority of my work is in the field of meta-research, which can involve investigating what was studied, why it was studied, and how it was studied. In addition to the more common forms of meta-research, like systematic reviews and meta-analyses, I look at the way that research is conducted, the quality of reporting, analytical choices during statistical analysis, and from where nutritional zeitgeist comes despite little strong empirical evidence. How did you become interested in calling attention to myths, presumptions, and reporting accuracy of nutrition research? As a student studying lipid chemistry, I noted that most lipid biochemists (as well as many others) recognized that dietary cholesterol had little impact on blood cholesterol, and yet cholesterol-containing foods were demonized. During my doctoral degree, I attended the Office of Dietary Supplements’ Research Practicum, where I anticipated learning what was and was not known about the health impacts of dietary supplements. Instead, and to my benefit, much of the talk was about limitations of current research, regulatory limitations, and differences in philosophies about how diet – and particularly supplements – could be studied. Claims about dietary cholesterol and supplements are just some of the dietary beliefs that are either completely refuted by our best science or at best weakly supported; yet, many people within and beyond the nutrition science community believe them. Thus my interest is at least two fold. The first is trying to determine which beliefs I hold that are not supported by the evidence, such as the relationship between eating/skipping breakfast and obesity. The other is to help communicate the state of science to hopefully decrease confusion. With the attention that your research group is calling to this movement, how do you see publication and the media’s attention to nutrition changing in the next 5-10 years? I am optimistic that nutrition science will continue to improve, including more discussions of the nuances of nutrition science rather than speaking in absolutes. If we ‘know’ that sugar is bad, or polyunsaturated fats are good, or that breakfast prevents obesity, then there is nothing left to study. Because of human heterogeneity within ever-changing local and global environments, it is unlikely that there is one diet or one set of recommendations that is appropriate for everyone and every situation, even for essential nutrients. Population-level recommendations are great place-holders until we develop more refined recommendations for individuals, subgroups, food-types, food-compositions, and other aspects of diet. In a recent ASN blogger interview with Paul Coates, the Director of the NIH Office of Dietary Supplements, he stated with regard to the aging of the nutrition researcher population, “A fairly urgent challenge is identifying people who can come up behind us and continue to identify opportunities for research—particularly those that have public health implications— and be committed to help tackle them.” What are your thoughts on strategies for engaging young nutrition researchers in scientific discourse? How can young researchers take part in a dialogue with fellow scientists, the media, and the public to improve communication and perception of nutrition research? I think we need to keep our eyes open for promising individuals that we can trust to think scientifically and ethically, and help them grow in a tailored way. The increased use of Individual Development Plans seems to be a great step in this direction, as is putting a maximum number of years on post-doctoral training, with the idea that a post-doctoral position is for additional training, not for an indefinite job. I have been extremely fortunate to have had mentors that gave me opportunities to speak, develop ideas, and truly contribute to teams and discussions throughout my formal education, as early as my freshman year. I was encouraged to write grants, publish, and complete other essential activities in the business of science, but my mentors focused very much on teaching me how to ask scientific questions; read the existing literature; develop critical scientific thinking skills; communicate with precision; and conduct good science. On the side of mentees and students, I think it is important to be inquisitive while being willing to admit if you don’t know something. Stating confidently something that is false is a great way to lose trust and be excluded from the discussion. Instead, ask for clarification; add information to the conversation that might be useful; and, most importantly, don’t force yourself into discussions just to be noticed. I also think it is important to move away from research focusing so heavily on public health (with the full disclosure that I work in a School of Public Health). Improvements in the public’s health is a noble and lofty goal, but to come into a study with the assumption that the outcome will result in an improvement in public health (particularly the entire population’s health) encourages overstating of results, misinterpretation of data, and doubling-down on dietary preconceptions. In science, the focus needs to be on determining some form of objective truth or lawful relationship. If we can identify these truths and relationships, then ways to improve public health will become self-evident, with the understanding that policy decisions are based on value structures beyond scientific evidence. What advice do you have for graduate students and early career investigators?